The Symbol of a woman was used in many different forms to illustrate their lives and those of their family. The Woman symbol is in a fact a cross between a pictogram and a symbol. The Woman symbol is featured in many pictograms such as the one illustrated below. A pictogram, also called a pictograph, conveys a story and meaning through pictures that signify and resemble the shapes of physical objects or people. An Ideagram is another form of pictogram which conveys complex ideas, feelings and emotions. A pictogram, such as the one depicting a Woman in the bottom right corner, is a therefore a form of writing which uses drawings to tell a story. The Nomadic lifestyle followed by a woman of a Great Plains Indian tribe coincided with the buffalo migration. 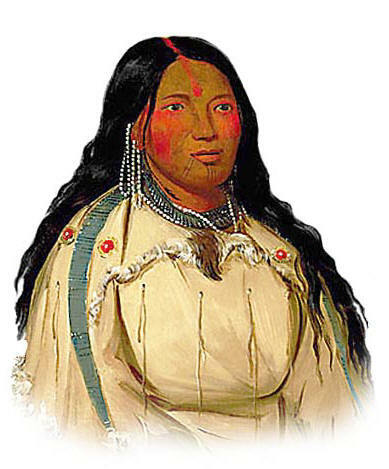 The role of the Native American Woman was often misinterpreted by the European settlers. The workload of the tribes was divided equally between men and women. The men were responsible for making weapons, hunting and protecting the women and children. Hunting and fishing were deemed as recreational by the Europeans so Indian men were deemed to be lazy. The woman was deemed to be the real worker as many of their tasks included physical work which Europeans found unacceptable. The role of the woman was to care for the home, the building and upkeep of their shelter, making clothes, fetching water, skinning animals and preparing food.